I'm not to the point where I go through packages of juice boxes for Cole's persistent thirst...well, because he would have no idea how to use the straw. Even at that, he doesn't like the idea of a sippy cup in general because it's not a bottle and it usually doesn't have formula inside. BUT when we do get to the point where when leaving the house requires containers of beverage just to be prepared (which is going to be a little trickier than dried formula in the easy no spill storage container), I'll be thrilled about this. 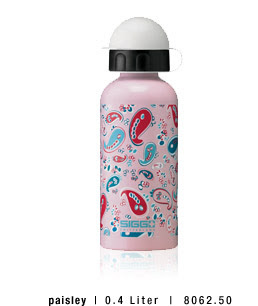 SIGG Switzerland makes an "environmentally responsible" aluminum bottle that claims unbreakable, leak proof, and absent of "taste transfer". For $15.99, I think I can handle living green (all reusable and recyclable)...especially since I can choose between paisley, polka dots, farm animals and singing giraffes, among others.